What do Vienna, Buffalo, Truro, Oshkosh, Toronto, Martigny and Greenville have in common? Well, for one, each of those places is home to a TEDx community and all of them have used Walls.io to set up social walls for their events. With this popularity, we wanted to know why TEDx and Walls.io are such a great fit. 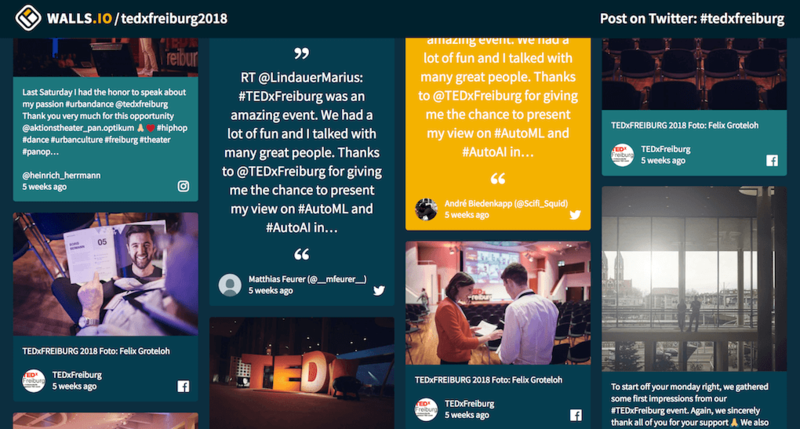 So we reached out to a few TEDx communities to ask them about how and why they use social walls. 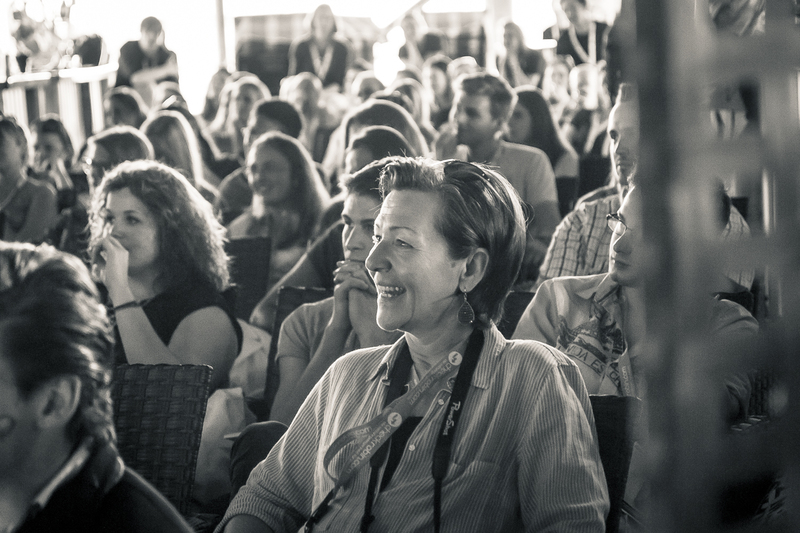 Would you like your next event to be as awesome as TEDx? Create a social wall and spark amazing conversations! 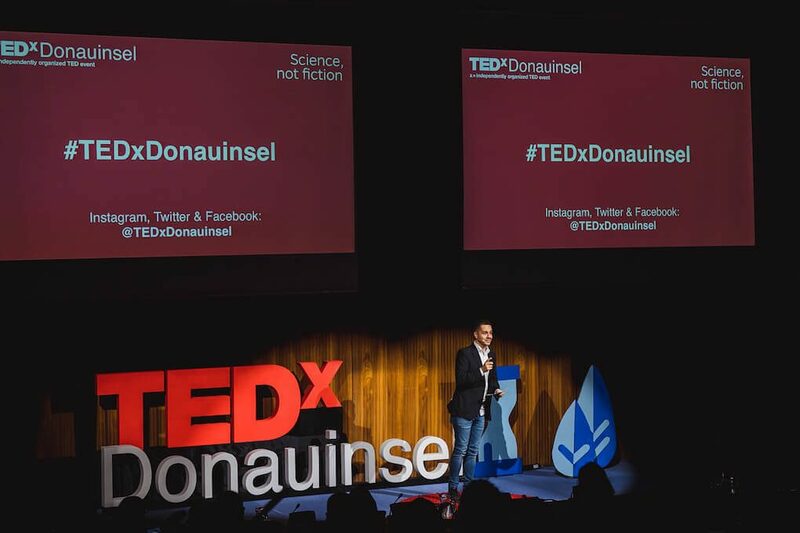 We talked to Mathias Haas, the organiser of TEDxDonauinsel, a TEDx event named after its special location right on the Danube Island in Vienna. The event was first held in 2014 and has been using Walls.io social walls for a few years now. Our second interview partners were Tobias and Gabriel Brüser. 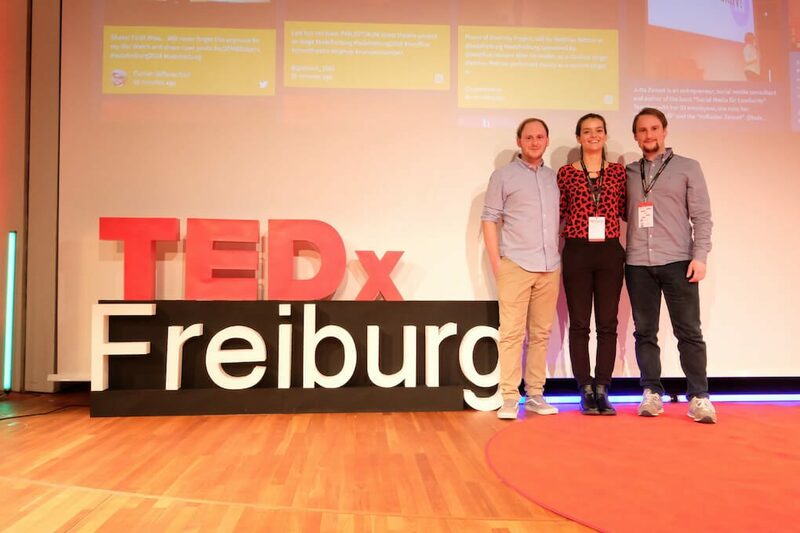 The brothers founded TEDxFreiburg in 2016. There are a lot of interesting takeaways from our conversations with these TEDx organisers that we want to share with you. We think that these insights will apply not just to TEDx events, but any kind of event that wants to use a social wall. TED Talks is a worldwide non-profit organisation founded in 1984 as a conference for Technology, Entertainment and Design. While the three letters still stand for those three areas of interest, TED Talks today cover a huge variety of topics, from music to science to popular culture and further. The TED community is one of the biggest and most extensive communities worldwide. The talks at TED events are filmed and then put online for everyone to watch. They’re also translated into hundreds of languages by volunteers. Furthermore, TED grants people around the world licences to organise their own TED events, so-called TEDx Events, with the “x” standing for “independently organised”. A lot of them refer to countries or cities (e.g. TEDxLondon), others to specific topics (e.g. TEDxWomen). The amazing thing about TED and TEDx is that the organisers are strongly connected globally. TEDx organisers, speakers and attendees everywhere use both their “own” TEDx hashtags as well as the more general #TEDx and #TEDTalks hashtags. There’s something pretty special about TED and TEDx events in that the audience and target group are extremely engaged on social media. I myself have attended (and volunteered at) TEDx events in the past and have always noticed how the conversation online naturally supplements the happenings and talks on stage. Tobias: At TEDx events, it’s all about sharing ideas. People want to discuss with other attendees and the speakers but also with friends not attending the event and the world! Often, the first choice is to create posts on social media. Social walls are an organic addition to social media-heavy events. They spark conversations and make it easy for people to share ideas. They are also a great way to make people who can’t attend an event feel included and give them a chance to participate. 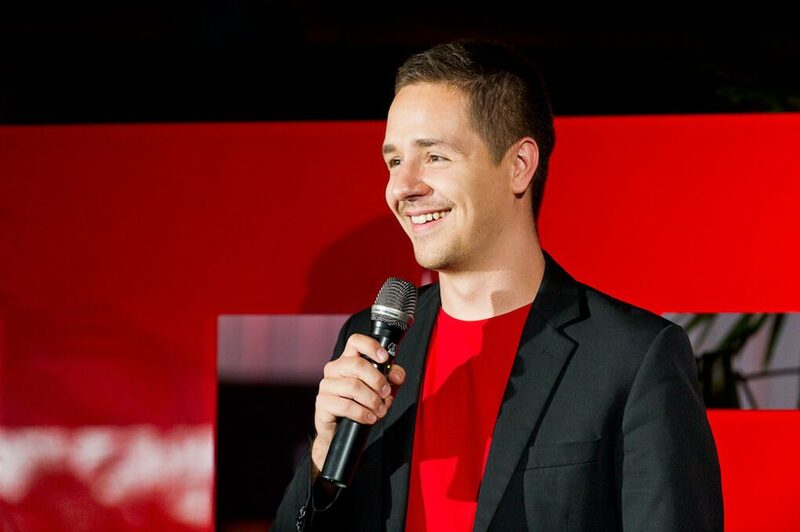 Mathias: TEDx is all about ideas and the conversations that will spark from them. The social wall helps accelerate these conversations as they’re accompanying the talks in real time, but it also serves as an archive for audience reactions after the event. Furthermore, a social wall can be a great informational hub at events. It is a great place for organisers to share information dynamically and display it somewhere central. Tobias: It’s very handy to use the social media wall as a central source of information. Besides the user-generated content, our team could post important information about the event. A social wall collects content regardless of the social network it’s posted on, so you can collect posts from Twitter and Instagram at the same time and display them in the same place. Use Walls.io Native Posts to share information, updates, etc. on your social wall. This feature lets you post text, image or video posts directly to your wall, completely circumventing your social media accounts. It’s a great way to disperse information at an event that isn’t necessarily relevant for your other social media followers. Learn more about Native Posts in our help centre. 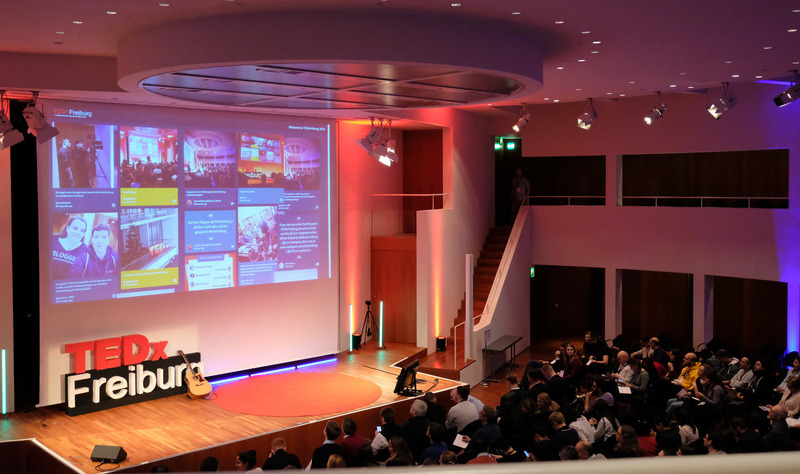 Hashtags and social walls have been around for quite a while but organisers still have to think about how they can best integrate them into their events to really make audiences engage with the wall and hashtag. The first step is to make it really easy for people to learn about the social wall by showing it at the event. Social walls function like campfires. They bring people together, gathering around it and engaging with each other both online and offline. A social wall at an event is a great conversation starter and entices people to post. Tobias: During the breaks, our social media wall was displayed on the big screen of the main stage. It really encouraged attendees to share content and get more engaged on social media. Showing your social wall on a big screen in your main event hall keeps people entertained while they’re waiting for the programme to continue. It also sparks conversation as people really love to find their own posts on the big screen. You can use a projector to display your social wall somewhere central or pepper smaller screens throughout your venue to create cosy corners where people can watch what’s happening online. It’s easy to display Walls.io on computer screens, TVs, iPads, using projectors, professional digital signage solutions and lots of other screens. Simply pull up your wall’s URL to display it. Of course, you also want to point out the social wall to your audience, simply by telling people about it. There are plenty of ways to do this. TEDxDonauinsel, as is now pretty much standard, had the event moderator announce the social wall and hashtag. They also communicated the hashtag on posters at the venue. Meanwhile, TEDxFreiburg tried out QR codes printed on name badges. 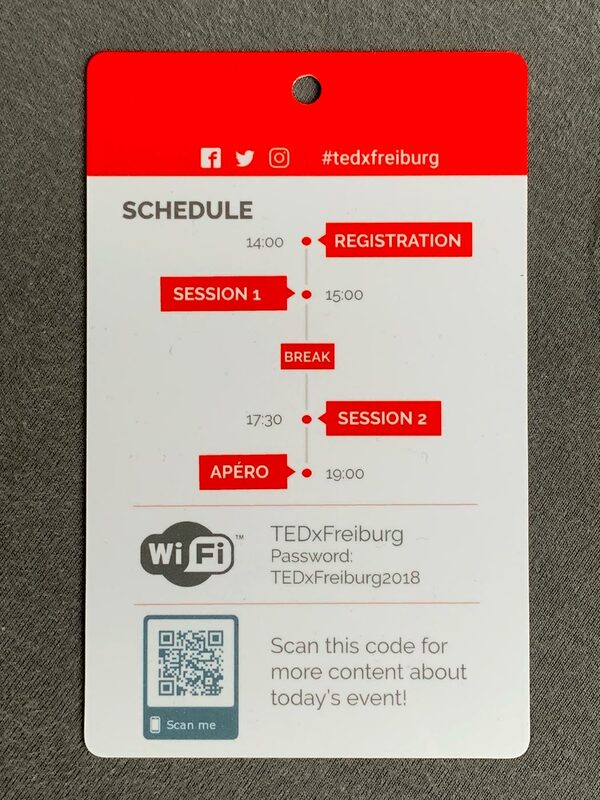 Tobias: At this year’s TEDxFreiburg, we had a QR code with a direct link to the social media wall printed on every name badge. A lot of participants tried it out immediately after registration. While QR codes have often been frowned upon in recent years, there are situations where they work extremely well. And this is clearly one of those situations. TEDxFreiburg provided attendees with an easy way to bring up the social wall, without requiring anyone to laboriously type up the URL. We always say that incentives really help — because it’s true. Prizes and rewards motivate people to take the time to create content and post it with the hashtag. Mathias: At one of our recent events, we handed out three prizes for 1) the person with the most social media postings, 2) the most liked/engaged with social media posting and 3) the best social media posting (selected by our team). This was a fun way to get even more people engaged. The prizes were, of course, tickets to the next TEDxDonauinsel event. This ensures that people are getting something they already want, which encourages them even more. It’s one thing to directly motivate the audience to post. But you can take this a step further at events that are based on people giving talks, the way TED and TEDx events are, by simply including your speakers in your communication efforts. By encouraging your speakers to share to your social wall you can engage your audience more. Attendees will appreciate being able to have a conversation with the speakers about their talks. It will also ensure that speakers enjoy their own event experience even more, as they’re getting a chance to spread their own ideas and have conversations with the audience. Mathias: Speakers are briefed to join the conversation on the wall as they get deeper feedback to their talks and also learn which parts of their talks were recognised by the listeners. Whenever possible, we also involve our speakers and partners in stories to build up the thrill before the event and after. This helps us get people motivated and excited but also serves as a platform to get our partners involved in our communication. The best thing is that speakers will also bring their own ideas to the event if you let them. One of the TEDxFreiburg speakers even organised their own competition on social media, utilising the #tedxfreiburg hashtag. At the end of the day (and after our talks with TEDx organisers), it becomes pretty clear why TEDx and Walls.io are such a great fit. Social walls and TEDx events both bring people together and spark conversations. They create a collaborative atmosphere where ideas are shared and discussed, connections are made. 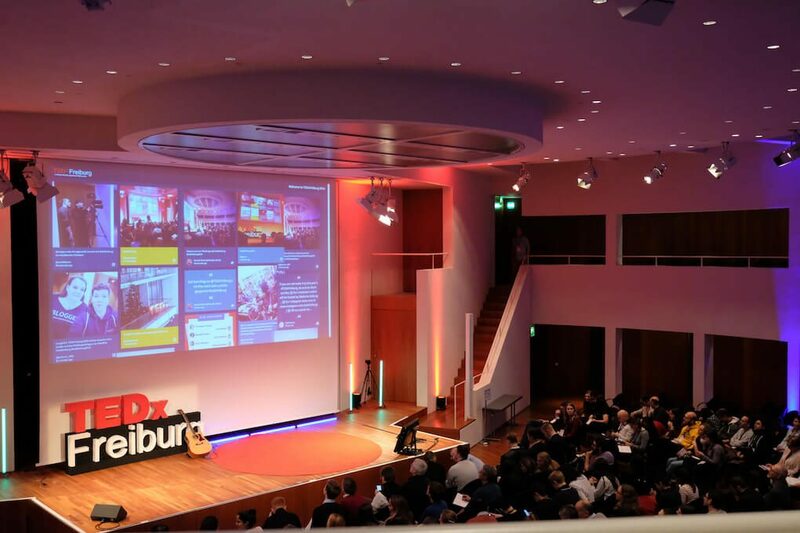 We’re extremely proud that many TEDx events have chosen and are continuing to choose Walls.io for their events. This is why, from now on, we want to offer all TEDx events around the world a 15% discount on subscriptions*. *This includes Pro and Premium subscriptions but not event passes. Check out our pricing page for more info about available subscriptions. Just message our support team from your official TEDx email address, tell us about your event and we’ll hook you up with that sweet, sweet discount.